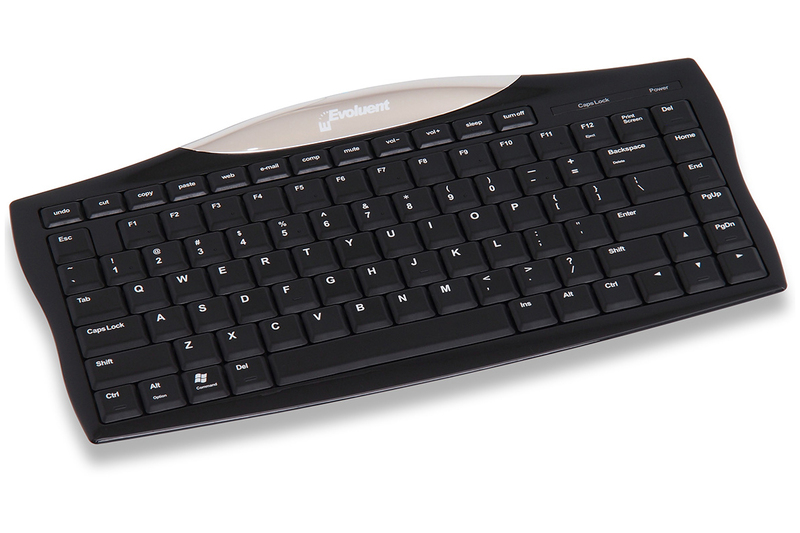 Standard Keys: Despite its compact dimensions, all the keys (including the function and modifier keys) on the wireless Evoluent Essentials Full Featured Compact Keyboard are standard sized, with standard key pitch (i.e. the distance between keys). 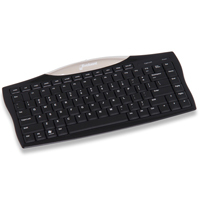 Package Contents: Evoluent Essentials Full Featured, Wireless, Compact Keyboard, 2 AAA batteries, 2.4 GHz receiver (not Bluetooth), extension cable for positioning receiver away from metal obstacles that may interfere with transmission. The light weight and ultra-slim housing of this mobile-friendly keyboard warrant a little extra care when handling. Try to type with as light a touch as possible to minimize the risk of damage to the keyswitches, and to prevent the housing from flexing. When removing the keyboard from a bag or briefcase, avoid damaging the keys by grasping the sturdy silver trim on the top edge (with the Evoluent logo).